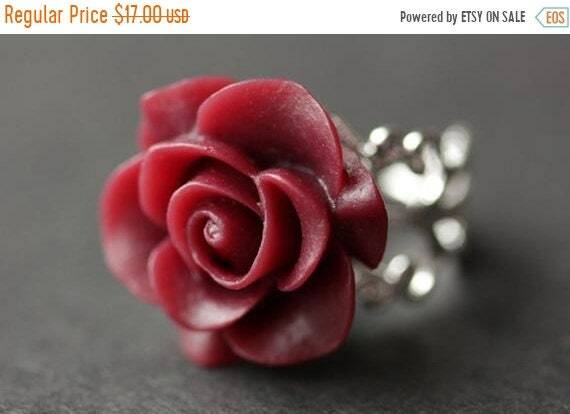 A dark red resin rose has been set upon a filigree adjustable ring base in your choice of finish in this handmade maroon rose ring that is created to be adjustable from size 6 and up. Very cute! Nice little package, quick shipping! Thanks! Maroon Rose Ring. Dark Red Flower Ring. Gold Ring. Silver Ring. Bronze Ring. Copper Ring. Adjustable Ring. Handmade Jewelry. the color in the photo is NOT what was sent. reached out to the buyer but she says that's all she had and offered refund.... she should have been more upfront on the listing that the color shown is NOT the same as what I bought. I will keep the ring... but cannot use it for my event. very disappointed. Customer satisfaction is extremely important to me. For this reason, I am always committed to including clear and concise listing descriptions and photos. The ring that was sent is the exact same ring as in the photo. I cannot speak for monitor resolutions and computer color settings which might distort the colors of items viewed on a computer, but as the ring was not a copy but the original from the photo. The offer of returning the ring for a refund was made and is still open, if preferred. I'm so sorry I couldn't be more help.